At what point does an Ironman melt? This weekend could reveal the answer. Record heat is expected to roast the region as tens of thousands of people head outside for two of the biggest community events of the year. The National Weather Service forecast calls for triple-digit highs, including 104 on Sunday – the final day of Hoopfest in Spokane and the day about 2,000 triathletes hit the Ironman course in Coeur d’Alene. Event organizers are bracing for health problems such as dehydration, cramps, sunburn, heat exhaustion, heat stroke and hyponatremia, or low sodium in the blood. 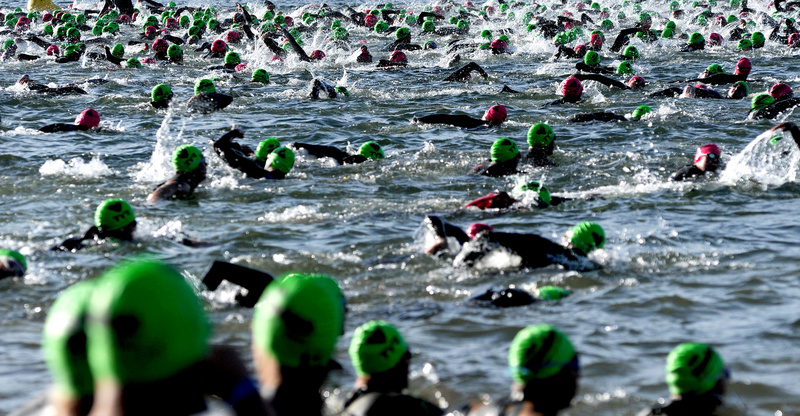 It’s shaping up to be the hottest Ironman in 13 years of the race in Coeur d’Alene, and competitors are being cautioned to take extra care to stay cool, hydrated and healthy for the grueling 2.4-mile swim in Lake Coeur d’Alene, 112-mile bike course and 26.2-mile run. “Clearly, this is not a day for anyone to go for a personal best. You really just need to stay well within yourself and monitor yourself during the race for signs you are overheating,” said Dr. P.Z. Pearce, founder of Champions Sports Medicine in Spokane and medical director for the first two years of Ironman Coeur d’Alene. When the level of sodium in the blood is too low, it can cause hyponatremia, a potentially fatal metabolic condition. “It’s one of the most serious things we see at Ironman,” Pearce said. Athletes also must protect against sunburn but use sunscreen that allows them to sweat. “The waterproof ones plug up the pores and you don’t sweat as well,” he said. Athletes should go a bit slower and take in more electrolytes and water throughout the race, said Keats McGonigal, operations manager for Ironman. The Hoopfest 3-on-3 basketball tournament ordered cool-air misters and fans for this weekend, and organizers plan to have extra water for court monitors, who usually spend six to seven hours on the asphalt courts. McGonigal said Ironman will have more water, ice and Gatorade on the course this year, and the medical and changing tents will have fans or air conditioners. Misting stations and cold sponges will provided on the marathon course, where competitors will experience the hottest part of the day. “We’re also hitting hard with athlete education, trying to communicate to them it’s going to be warm and that they need to plan their nutrition and their hydration and pacing accordingly in order to have the most successful day they can,” he said. Usually, the cold lake temperature is one of the chief environmental concerns of Ironman Coeur d’Alene, but lately the water has been above 70 degrees. Many swimmers likely will forgo wetsuits this year, McGonigal said. The marathon will be especially taxing. “Probably most of our patients will be during that run course,” said Tom Greif, deputy chief of operations for the Coeur d’Alene Fire Department, which provides emergency medical services along the Ironman course. “You’re looking at athletes being out there for 12-plus hours, some of them as much as 16,” Greif said. “We expect to see a lot of athletes not being able to adapt” to the heat. Racers should not hesitate to stop to rest and cool off, or even quit if they feel they are overheating, Pearce said. The inaugural Coeur d’Alene Ironman in 2003 saw a high of 100 degrees, and more than a quarter of the athletes did not finish that year. Staff writers Jim Allen and Mike Prager contributed to this report. Published: June 22, 2015, 8:21 p.m.